Speed. That’s what it’s all about. But where is the best place to score a hit—figuratively speaking, of course? We’re not even going to mince words on this one: Indy is the place to be. First, you have the timing. 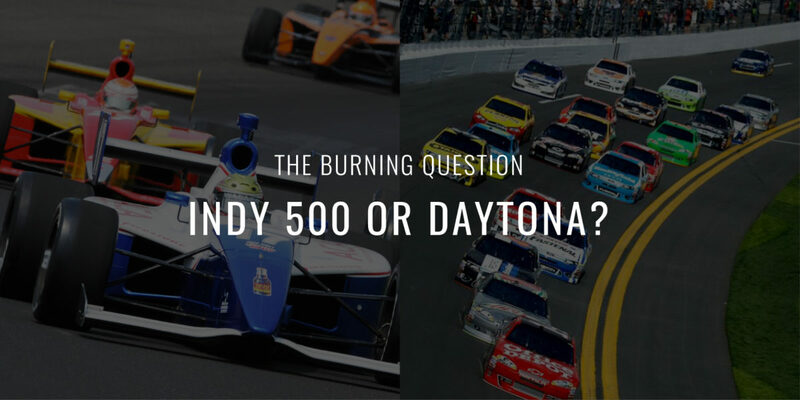 The Indianapolis 500 is always held on Memorial Day weekend, which means that the green flag isn’t just giving the “go” signal to a phalanx of high-performance Indy Cars—it’s effectively kicking off the entire dang summer in one massive, engine-revving roar. Daytona, on the other hand, usually takes place . . . well, a few weeks after Groundhog Day. Not the same thing. And then there is the feel of the race itself. Because while sure, Indy has the lack of banking on the curves, the famous glass of milk, Bump Day, and all the other traditions that have accumulated over its glorious hundred-year history, we say what it really comes down to is the environment. “Ambience” is too high-fallutin’ of a word, so to put it more simply, the race is fun as sh*t. Goosebumps when the flag goes down, and adrenaline-spiked good times for the next three hours. Which one might expect from the single biggest sporting event in the world—almost half a million people gather to see the winner. Half a million people who are also bringing in their own coolers of, well, just about any drink you can think of. That’s right, attendees can bring in an entire cooler of whatever the hell they feel like drinking. And with that many people, and that much booze, all crammed into a 2.5-mile oval, the applause is thunderous and the feel is electric. It’s an experience that the stock cars down in Florida just can’t compete with. Daytona may be A great race, but Indy is THE race. Period. And we’ll pair our “jorts” and our Dew & Beam with a definite article and a declarative sentence any day of the week.